Express Bus’ drivers are among the top industry professionals. Drivers are highly trained in safety, operational procedures, and customer service. Express Bus’ drivers must complete over 40 hours of training and education prior to being certified to drive. Additionally, all of our drivers are obliged to complete several training days throughout the year. 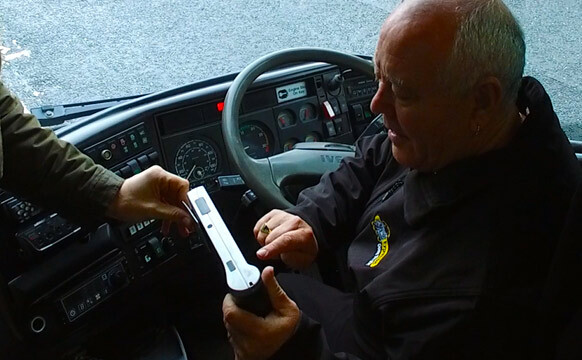 All Express Bus’ drivers are Certified by the Road Safety Authority of Ireland. Each driver is required to maintain this certification while working with our customers. All drivers while working with children must be vetted by the Department of Justice. All Express Bus’ team members must pass a drug screening prior to employment, and Express Bus’ drivers are subject to random alcohol testing, above the RSA standards. Last Year, based on customer feedback Express Bus’ drivers received a 97% customer satisfaction rating, and since 2013, our drivers have received a top score in driver fitness. Express Bus’ drivers make your experience fantastic. According to last year customer feedback, 98% of our customers would recommend Express Bus and a big reason are our drivers. Express Bus’ drivers are friendly, courteous and trained in customer service. Our professional drivers are always willing to help make your journey a memorable and pleasant experience. Express Bus’ drivers received a 4.9 rating from our customers. Due to such a high rating Express Bus are ranked among the top 2% companies in the industry. Receive the best in charter bus transportation when choosing Express Bus. Learn more about our driver training and experience confidence with your charter bus experience, feel free to view our trophy case.